If you are missing one or even several teeth, dental implants are an alternative to removable partials or even dentures. 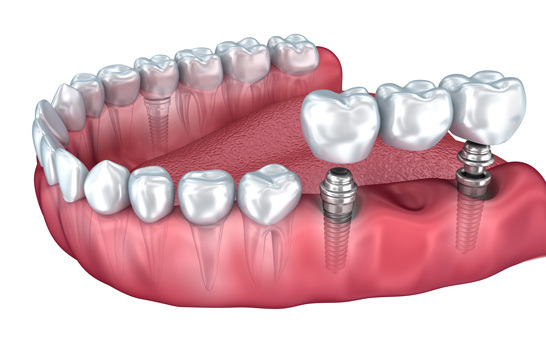 Dental implants are surgically placed into the jaw bone to replace the missing root structure. In the case of a single missing tooth, we are are able to place a crown directly onto the implant abutment. This is a conservative alternative to a conventional bridge in that the original integrity of the adjacent teeth is maintained. A single dental implant feels and functions like a natural tooth with minimal to no changes in your oral hygiene regimen. If you are missing more than one tooth, often an implant bridge will be a good choice. Two or more implants can be placed on either side of the missing teeth, thereby creating anchorage for an implant-supported bridge. The main advantage of this treatment option is that it avoids the patient having to take an appliance in and out of their mouth, as is the case with a removable partial. 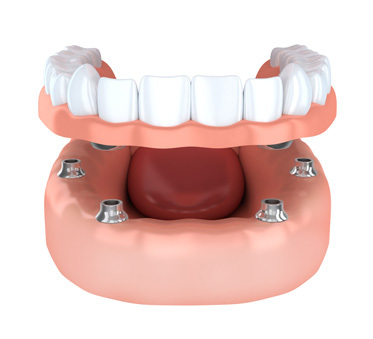 Implants can also be used as support for an overdenture, where the implants are used to increase retention, stability, and comfort versus a traditional denture. Contact our office to see if you are a candidate for any of these treatment options. We can create and implement a treatment plan tailored to suit your needs and budget. We are experienced in restoring dental implants and enjoy providing beautiful, affordable, and long-lasting solutions for our patients. We look forward to helping you restore your smile. When a missing tooth has to be replaced, dentists insert a titanium implant into the jawbone. As the implant heals, bone grows around it to hold it in place. This process– called osseointegration— occurs over the course of two to six months. 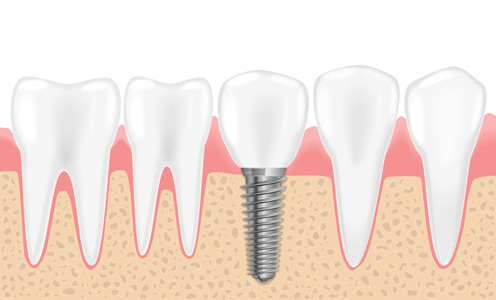 Once the implant is secured within the jawbone, we place a crown onto the implant. The number one advantage of a dental implant is that it is a more conservative option for tooth replacement. Implants do not involve altering several adjacent teeth to replace one. Durability: Because implants are fused with bone, they are a strong and permanent solution to missing teeth. Long-Lasting: Implants will last the rest of your life and are sturdy enough to withstand everyday activities. Natural look: The implant and crown will match the size and color of your natural tooth. No one will be able to tell that you’ve had a dental implant. Stability: Dental implants do not require support of neighboring teeth to anchor them in place. Therefore, the adjoining teeth do not need to be altered. Good oral health: Missing teeth can cause your other teeth to shift, affecting your bite and ultimately, your oral health. Implants solve this problem. Restoring confidence: Having a missing tooth can make you self-conscious. Implants can give you confidence in your smile.